The cruise industry is the fastest growing category in the leisure travel market with over 27 million passengers expected to cruise in 2018. To cater to this demand, cruiseliners are launching new ships with ‘never seen before’ facilities and amenities to WOW passengers. 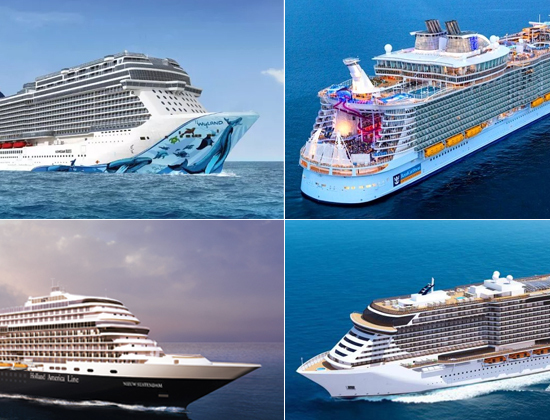 In 2018 alone, 15 oceangoing cruise ships - ranging in capacity from 100 to 5,400 passengers - will be launched with new onboard attractions like electric Go-Kart courses, multi-slide water parks, laser tag arenas and floating deck space. Five of the new ships fall into either the traditional or luxury expedition category, where kayaks and snorkel gear are kept onboard for daily use and observation lounges offer some of the most prime sightseeing in the world. Going on a cruise aboard one of these new ships is as much about the experience aboard the ship itself as much as exploring foreign destinations. This blog talks about the best new ships launched in 2018. Symphony of the Seas: Royal Caribbean’s latest addition to its Oasis Class is not only the grandest ship on the horizon but is also the largest ship in the ocean with over 6,870 passengers on-board and weighing a gigantic 230,000 tonnes. The ship, divided into several neighbourhoods, is like a floating city in itself, with accommodation ranging from Royal Suites, Family Suites to Balcony Overview and Interior staterooms. A first for cruises, Symphony introduces a two deck high family suite, with a slide between floors! The ship has its very own Central Park, with stroll paths lined up with over 12,000 trees and plants. Other perks of this uber- luxurious ship are the countless restaurants and shopping options on the Royal Promenade, Splashaway Bay, an aqua theme park for children and even a Tony Award winning Broadway production, Hairspray. The cruise will commence its sailing from Barcelona in April and continue to cruise along the Mediterranean till September in week long cruises. Norwegian Bliss: The Norwegian Bliss, among the ten largest ships today, takes you along a seven day enthralling voyage to Alaska from Seattle, Washington, exploring the wildlife and beauty of the snow-capped Alaskan countryside. Aboard, the ship can accommodate over 4,000 passengers, being the largest of its sister ships, Norwegian Escape and Norwegian Joy. The ship has a total of 2206 staterooms, in 42 categories, with over 82 single cabins with virtual views and exclusive Studio Lounges. As for dining options, passengers have eleven primary choices, including experiencing new flavours at signature specialty restaurants, such as Le Bistro, La Cucina, Cagney’s Steakhouse and Bayamo by the award winning chef Jose Garces. Another remarkable attraction here is a two-level electric Go-Kart Ferrari Racetrack, a first for a cruise ship based in North America. To add to the delight of passengers, Norwegian Bliss also offers the Tony award winning hit ‘Jersey Boys’ in its massive 800 seater Bliss Theatre. Other highlights are the Supper Club, Art Gallery, the Cavern Club, a replica of the Liverpool music club, an aqua park for kids, and the breath taking Waterfront Promenade. MSC Seaview: MSC Seaview was built specifically for cruising in warmer climates, and summer is thus the best time to make the most out of this ship. Most of its attractions are spread out over its huge 463,000 sq. ft. outer space, with extra wide promenades, comprising of a number of shops, bars, and even an AquaPlay and AquaSpray section designed specifically for younger kids. The ship explores several exotic destinations across the Western Mediterranean including ports of Barcelona, Spain, Marseille, France, and Genoa and Naples in Italy. The ship shifts to South American destinations in the winter months, over week long cruises. With over 4,000 passengers aboard, MSC Seaview provides a range of 2070 staterooms in 34 categories, the largest being the Yacht Club Royal Suites as well as suites with terraced balcony staterooms providing a direct view of the Mediterranean waters. The most memorable times that you will have aboard will be in exploring the plethora of lounges, clubs and other entertainment venues for adults, teens as well as children, particularly the spectacular restaurants, offering sea food, fine dining steakhouse, and the Hawaiian-influenced pan-Asian restaurant from celebrity chef Roy Yamaguchi. 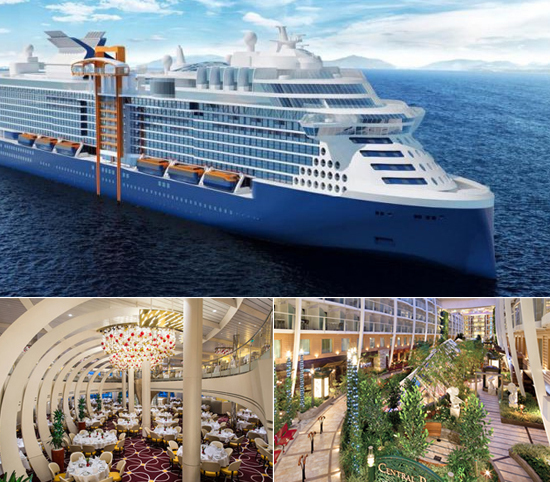 Celebrity Edge: What the Celebrity edge will be most remembered for is perhaps the Magic Carpet, a glass structure the size of a tennis court able to traverse over fourteen stories, like a giant magical elevator, mounted on the ship’s starboard side. It offers varying views of the oceanside coupled with comfortable seating, and a mesmerising ambience augmented by live performances. The ship is the first of the four Edge class Celebrity Cruises, traversing the Mediterranean as well as the Caribbean islands and Bahamas. It accommodates over 2,900 passengers, with the remarkable dual-Iconic Suites, each over 5,000 square feet with their own private Jacuzzis and cabanas. Other attractions include over fifteen restaurants and cafes, twelve bars and lounges. The Lawn Deck is equipped with real grass as well as a number of chairs on deck, ideal for undisturbed sun bathing. If on the Celebrity Edge, do not miss the Eden Lounge, a three deck high lounge-bar-restaurant venue with live music and ever changing show programming. Also, the Ship is completely a smart-ship, with smart phone accessible staterooms, as well as touch screen accessible services within the room, whether it’s your lighting or temperature. Another first-of-its-kind novel feature is the outdoor veranda that can be converted into an indoor sun room at just the tap of your device. Nieuw Statendam: Nieuw Statendam, meaning ‘New Statendam’ pays homage to MS Statendam, the 5th Statendam named vessel since the inception of the company in 1898. Primarily touring the Caribbean and Bahamas in roughly week long back-to-back cruises, the ship will move to the European waters in the summer, covering cruises to the Norwegian Fjords and the Baltic Sea leaving from the homeport of Amsterdam in Holland. The ship accommodates an impressive 2,650 passengers in over 1300 cabins classified in thirty-five cabin grades. Living up to the renowned Holland American dining experiences, the ship goes a step further by providing its guests with a royal fine dining experience in the Dining Room, a two storey formal dining avenue, the Sel de Mer, a speciality restaurant serving only French seafood, exquisite Asian cuisine at Tamarind as well as the good old fast food in New York Deli. The ship also has multiple theatres, The World Stage being the largest, with 270 degree LED Screens for multiple stage configurations, The Lido Pool, a giant pool with three whirlpools and two levels of cushioned lounge chairs. The biggest dance floor on the ship can be found on the Queen’s Lounge, designed specifically for the best musical experience imaginable, including the famous B. B. King’s Blues. Seabourn Ovation: Designed for nothing but sheer luxury, Seabourn Ovation follows in the footsteps of its sister ship Seabourn Encore, launched in 2016, becoming the newest vessel in the Seabourn fleet. The ship will cruise through the Mediterranean though the summer and fall, then moving onto Asia for the winter, cruises lasting from 7 night voyages to extensive 56 night voyages as well. Termed as the most luxurious cruise, the ship only has 600 passengers, with only suites for accommodation, each having its own private veranda, the grandest being the five Owner’s Suites and the Penthouse suite. The vast space is full of varying entertainment options, with Casinos, Card Rooms, Grand Salons, Fitness centres, bars and lounges and motion studios. As for dining options, like everything else, the leisure of the guests is the top priority, with the ship being operated on an all-inclusive deal. Thus, guests can eat at any venue (all complimentary) at any time, as per their choice. The options include the main restaurant, a Sushi restaurant, the Grill by famous chef Thomas Keller, to name a few. The industry has indeed left no stone unturned to provide guests with their every desire and to cater to their comfort. From the largest ship in the world, to the most luxurious, ships today are so much more than mere vessels, pun intended. The sheer scale at which they have been built, at the very front of the times, is nothing short of astounding. It can suffice to say that sailing aboard these wonders is beyond what one can dream, keeping you under such a spell of euphoria that you never want to reach the port! As I said before, it is not so much about the destination anymore.